How Obesity Harms Feet | Podiatry Associates, P.C. It’s been years since the movie Super Size Me came out and highlighted the debate about popular fast foods and what they do to your health. Although the movie has good points and aspects that people critique, it certainly spotlighted how negative excess weight gain can be for your body. 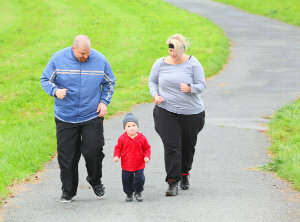 In a country where obesity is a real problem, more and more people are experiencing those negative effects. Not only are these problems body-wide, but obesity harms feet, too, in ways you might not expect. Being overweight puts a lot of strain your muscles, joints, and bones as your body copes with supporting more weight than it was designed to handle. Not only can this cause weight-related foot problems like plantar fasciitis, fallen arches, and general soreness, but it contributes to some chronic conditions. The heavier you are, the more likely you’ll develop circulatory problems, diabetes, and arthritis, among other things. Each of these chronic conditions can have harmful effects on your lower limbs. Circulatory problems – Obesity stresses your heart, forcing it to work harder to simply pump blood normally. Worse than that, it contributes to plaque build-up in your arteries, which blocks blood flow. In your feet, this can cause cramping, hair loss, and much slower immune responses. Diabetes – This systemic disease seriously weakens your lower limbs, damaging your nerves and potentially corroding your bones. Over time, this puts you at high for injuries like ulcers, which can lead to life-threatening infections and even amputations. Arthritis – Extra weight on your joints compresses them and wears away the protective layering. Eventually this can make it extremely uncomfortable to use or bend those joints, limiting your mobility. Unfortunately, the heavier you are, the more likely you’ll suffer from weight-related foot problems. Obesity harms feet in too many ways—even just daily chores can be enough to cause problems when you are overweight. The good news is that you can manage this. Working with your health team, including our experts here at Podiatry Associates, P.C. can help you protect your lower limbs from pain and injury, as well as safely lose weight. Don’t take your weight for granted. Too much can be at stake for your lower limbs. Call (303) 805-5156 or use our website to make an appointment today.